Why would I read this? For one, it takes place in my hood. Two, it's by John Muir, the famous Scottish/American naturalist and founder of the Sierra Club, which saved national treasures like Yosemite and the Sequoia National Park. 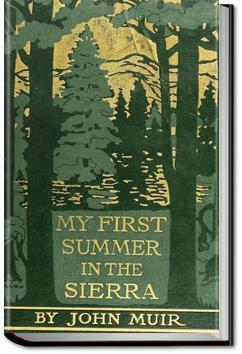 My First Summer in the Sierra is a journal, not a novel. As a journal, it garners an A+++ from me. Here I could stay tethered forever with just bread and water, nor would I be lonely; loved friends and neighbors, as love for everything increased, would seem all the nearer however many the miles and mountains between us. Listen to Bach, Brandenburg Concerto No. 3 – this is how you will feel while reading John Muir. Exhilarated. Joyous. Passionate. Alive. This book is never far from my reach. It is my inspiration for life.